Marketing is not a one-size fits all process – small town business marketing ideas differ from marketing ideas that work in a city. In order to be successful, you must cater your marketing toward your target customer audience and reach them appropriately. The first thing to do is to figure out how to market yourself to your customers. Who are your customers? Where do they spend their time? What are they interested in? Once you determine who you are marketing toward, then you can start to work on the marketing. Look up the demographics of the area before you start to market – find out who is in your audience. Are you marketing to a community with young children, stay at home parents, church-goers, Veterans, eco-conscious vegetarians, farmers, Spanish-speaking agricultural workers, or motorcycle riders in their 50s? Do some research before you start. Once you know who you’re marketing to, you can develop your messaging in accordance with the local culture. Messaging is part of marketing strategy and is important to lock down. Depending on the town, the population may have conservative religious and political views or be focused on sustainability and town preservation. Family values and town traditions may resonate more with small town or rural community than innovation and technological change. Read the local paper for news about the area to learn more about the community so that you can resonate with people. Structure your messaging to mirror the tone of the small town or area that you’re marketing to. Hunting humor that is appreciated by one community with a hunting culture may be offensive to another community seeking to protect an endangered species. Keep local culture in mind when marketing to a small town or rural community. Online marketing efforts in less populated areas will differ from online marketing efforts in more populated areas. In a small town or rural area, you will be marketing to a smaller number of people. Depending on your business you may have a lot or very little competition. If you don’t have a lot of competition, your business will be easier to find online. But, just because you’re easier to find online, doesn’t mean that people are looking. Rural customers are less likely to have high speed internet than customers living in cities or even small towns. High speed internet is costly in rural areas and landscape like mountains in some small towns makes internet service unreliable. While internet at home might not very common, that doesn’t mean that online marketing is out of the question. Many people living in small or rural towns use their cell phones to access the internet instead of a home computer. What does that mean for your business? If you are marketing toward people in small towns or rural areas, your business website must be mobile friendly. Google is cracking down on mobile responsiveness for websites. Websites that are not optimized for mobile devices like cell phones, tablets, and iPads will be ranked lower in search engine results than websites that are mobile responsive. Check here to see if your website is mobile responsive. Mobile responsiveness is important for your business – if potential customers cannot access your website online, they cannot learn about your business. If your website doesn’t pass Google’s mobile-friendly test, Perihelion can build a mobile responsive website for you. Registering your business with online directories like Google+, Yelp, and Yellow Pages is important when you’re marketing in less populated areas. Depending on the town, people may not travel in the direction of your business on a daily basis and may not see that a new business has opened for weeks or maybe even months. By registering your business with online directories, potential customers who are looking up your type of business on Google or Yelp will come across your business when they need it. Not only are online directories good for reaching local customers, it will also help you get found my people driving through the area. If you’re opening a business that is off of a major transit way, you may pick up customers passing through. You never know who is looking for your type of business on their road trip to visit the Largest Ball of Twine. Facebook or AdWords advertising may beneficial to marketing in a small town. With Facebook Advertising, you can build your ad’s audience based on demographics or a geographic radius. You can run the ad on desktop or on mobile devices. You can even cater the ad toward locals who Like specific Facebook pages like the local Chamber of Commerce or by profession, like farmers. In a small town or rural area, AdWords can help your small business get found on local geographic searches more than other companies. If you’re seeking to build an online presence, or are a seasonal operation looking to make a splash, a Google AdWords campaign can give your business a boost while organic traffic to your website builds up. In a small or rural town, you can be sure that word of mouth referrals will be a good way to get the name of your business out. But in order to get people talking about your business, you first have to gain their trust. Don’t barge into small town claiming that you’re the best thing since sliced bread. Aside from the fact that sliced bread is pretty great, people simply will not trust you. If you go in trying to establish relationships with other business owners before establishing a rapport, they will think you’re trying to scam them. Small towns and rural communities are tight-knit groups of people. They know their neighbors, probably grew up together, and help each other out. This type of community is great for a business’s reputation, but you need to earn the trust of a rural community first and build your reputation. Start by introducing yourself to people before marketing yourself to them. The most important part of selling your product or services is helping people. Get to know the people in the small town or rural communities – not only will they learn to trust you once they know you’re genuine, but they will also open up to you about themselves. This will enable you to figure out how your business can help them – an integral part of your marketing messaging. Getting the word out about your small town business may seem daunting, but by using these methods, you can soon be on your way to successful marketing! We are 5 months into a new year with new opportunities to grow and renew. But it’s also a time to look at expenses and re-evaluate where we’re spending our resources of time and money. Among the decisions that many local area business owners will face this year is whether to join or renew their membership in our local Chamber of Commerce. If you don’t want to support a local organization that supports you, your business and community year round then don’t join the chamber of commerce. If you don’t want to support the group that is often the first personal point of contact with an opportunity to make a positive first impression for people considering visiting or relocating to our community or the surrounding area then don’t support the The Dalles Area Chamber of Commerce. Chambers of commerce have been around for decades. You might say that with the Internet and social media a chamber of commerce is not needed. You might say it is not always the first point of contact for information because potential visitors and new residents can surf the web to get information on The Dalles and surrounding communities. While it is true that people can gather a lot of details on the Internet it is also true that information may have been placed in prominent digital locations with the help of the local chamber. And, regardless of where or how potential visitors, new business owners or residents got their initial information, the chamber often serves as the first real personal point of contact for those folks. If they have already done research and determined they might like to pay the city a visit there’s a good chance they may pick up the phone or make a point to stop by the chamber offices on their first visit for a more personal contact. On the down side, like most investments, joining a chamber of commerce has cost associated with it. There is the cost of a membership and the potential cost of time to attend meetings and show support at public events by helping out. Each of us needs to weigh the positive and potential negatives of joining or renewing our membership. We need to evaluate whether money spent or the time invested in going to ribbon cuttings, helping out at events like the annual NW Cherry Festival, the Starlight parade or other events is worth our time. That is one of the positive attributes of supporting our chamber. It offers a wide variety of networking opportunities and we can pick and choose which ones to participate in. If we want to get full value for our investment we will get involved in at least some of those events and activities. For a new business starting up the outlay of dollars and lack of available time may deter the owner from joining the chamber. On the other hand, what good is investing in a new business if there are no customers and if you are not taking full advantage of marketing opportunities. Your firm may have a web page. You may be aggressive in your social media marketing. You may know people in town already. Regardless, there is nothing like the personal touch of meeting potential new customers and clients face-to-face and one-on-one. The chamber offers plenty of those types of opportunities. The organization also does a lot to help support its members with publicity. 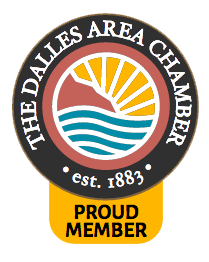 The Dalles Area Chamber of Commerce offers increased exposure for your business through its Website, its Social Media Posts, Membership Directory and through other avenues both online and offline such as photos and mention of new member’s ribbon cuttings published in the pages of local newspapers. Even if your products or services are something a person might not need on a routine basis just the fact that you are a member in good standing of the chamber helps validate your business to potential customers. For visitors and residents alike, being a chamber member can give a business the needed boost for having people make contact when the need does arise. Networking can be a pain if you’re cold calling. But if you’re in the same place, whether it’s the annual membership meeting, a chamber hosted ribbon cutting or monthly meeting, it is easier to make those contacts. Being a member of the The Dalles Area Chamber of Commence by itself is not going to make or break your business. But it can be an important part of your business’s marketing plan. When time comes to consider joining or renewing membership please support the organization that supports you, your community and your business throughout the year and throughout the decades.